Choose from the wide range of Hooks & Holders by Exclusive Furniture World. Solid wood bracket with 6 large hooks and 12 smaller hooks. A sturdy product, well made from s.. Distressed wooden coat hook shelf in the shape of a staircase. This item is made to look aged so eac.. Toilet roll holder on all metal construction stand with ornate scrolled features. Antique matt white..
Wholesale Vintage/Shabby Chic Style Dog Shape Yellow Hanger with 3 Hooks 32.5 x 34 x 1 cm. Manufactu..
Wall mounted varnished mango wood wine rack to hold four bottles. The overall size is 20cm wide, 7cm..
Wall mounted varnished mango wood cut out welcome frame with four metal hooks. The overall size is 3..
White Heart Metal Towel Rail Dimensions:H20 x W51 x D7 cmMaterial:MetalEAN:6490164077446Packing Spec..
White Heart Toilet Roll HolderDimensions:W16 x D9 x H15 cmMaterial:MetalEAN:6490164981552Packing Spe..
White wooden shelf with hooks and a slot to slide in letters. 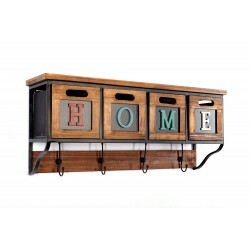 The letters spell out "LOVE" with two ..
Wood & Metal Wall Cupboard with Coat Hangers 81 x 20 x 35cm. Well made very useful wall cupboard.. This wall mountable unit provides an alternative yet practical storage solution for your keys or sma..
A natural toned wooden bottle holder with space for 3 bottles. Complete with ÔWINEÕ lettering cut ou.. Solid dark wood hanger bracket with 4 hooks. A sturdy product, well made from solid wood. The hooks .. Solid Wood hanger with two hooks. Features a beveled circle pattern on the hanger. The hooks are 7cm..